over the first week of winter, however the number of auctions dipped compared with the previous week. There were 1,953 auctions held over the week, down from 2,480 last week, however higher than one year ago when 1,201 auctions were held and auction volumes were low due to the Queen’s birthday public holiday in all cities with the exclusion of Perth. Preliminary results show that 70.4 per cent of capital city auctions held this week were successful, rising from a final result of 67.7 per cent last week. One year ago, across the lower number of auctions, 78.5 per cent sold. Melbourne and Sydney, the two largest auction markets have maintained strength this week, while across the remaining, significantly smaller auction markets, results have been more varied. This week, 959 residential properties were taken to auction in Melbourne with 71.4 per cent clearing, based on preliminary results. In comparison, over the previous week 1,170 auctions were held with a 71.5 per cent clearance rate, while one year ago, given the following Monday was a public holiday, just 315 homes went to auction, with a strong clearance rate of 80.3 per cent. While Melbourne as a whole had a clearance rate of 71.4 per cent this week, across the individual sub-regions clearance rates ranged from as high as 79.2 per cent across the Inner South region and as low as 60.6 per cent across the South East region. The busiest sub-region for auctions was the Inner region with 180 auctions. from 73.2 per cent last week to 76.7 per cent. The number of auctions held across the city this week was lower than last week, at 654, compared to 811. One year ago 603 Sydney auctions were held with 88.7 per cent clearing. So far this year, Sydney’s clearance rate has remained relatively robust, after dipping to as low as 52.9 per cent at the end of last year. However, results across the city are substantially lower than they were at the same time last year, and the volume of auctions held over the year to date is around 20 per cent lower. This week, the City and Inner South region had the strongest preliminary clearance result across the city (85.7 per cent), followed by Ryde at 85 per cent and Eastern Suburbs at 84.9 per cent. This week auction activity across Brisbane fell, from 192 auctions last week to 129 this week. Last week Brisbane’s clearance rate was 41.7 per cent, however preliminary results show a weekly rise to 55.4 per cent this week. One year ago, 130 Brisbane auctions were held with a clearance rate of 48.5 per cent. Across the Gold Coast, the preliminary clearance rate this week is 35.3 per cent, compared to 40.7 per cent last week. There were 46 auctions held across the region, down from 84 last week. The preliminary auction clearance rate for Adelaide was 67.2 per cent this week, up from 52.6 per cent last week, which was the second lowest clearance rate result seen across the city so far this year. 98 homes were taken to auction this week, compared to 125 last week. Over the corresponding week last year, 62 Adelaide auctions were held with 71.2 per cent clearing. Perth’s preliminary results show that 30 per cent of the 10 reported auctions were successful this week. Perth’s clearance rate tends to move around a lot, however this week’s result is only slightly lower than last week (30.6 per cent) and down compared to last year (45.9 per cent). For the first time in five weeks, Canberra’s clearance rate edged over the 70 per cent mark last week, recorded at 70.5 per cent. 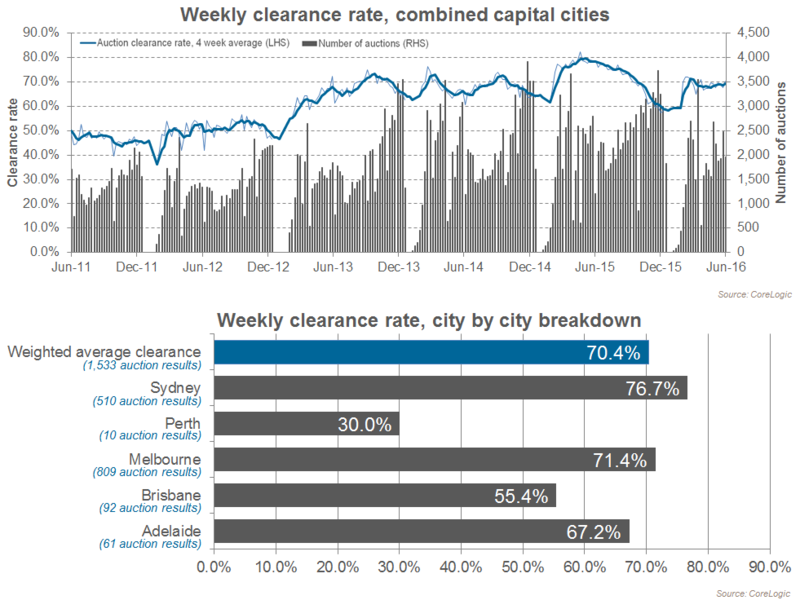 This week, however, the clearance rate for the city fell to 46.8 per cent across 77 auctions. One year ago, Canberra’s final auction clearance rate for the week was 61.3 per cent across 38 auctions. 8 auctions were held across Tasmania this week, with 4 reported so far and 3 sold.